Jean-Claude Van Damme is finally breaking his silence on the events surrounding his firing from 1987's Predator. The actor is currently promoting his latest movie We All Die Young, which is out today on VOD and in select theaters. Back when Van Damme was working on Predator, he was brand-new in the entertainment business and wanted to make a name for himself, specifically focusing on his martial arts background, which he wanted to include in the movie. There are several different accounts regarding his firing, but we'll go with his side of the story first. As it turns out, Jean-Claude Van Damme knew right from the start that things weren't going to work out for him while working on Predator. One thing that everybody can agree on is that it was hot and humid working on location in Puerto Vallarta during the production. 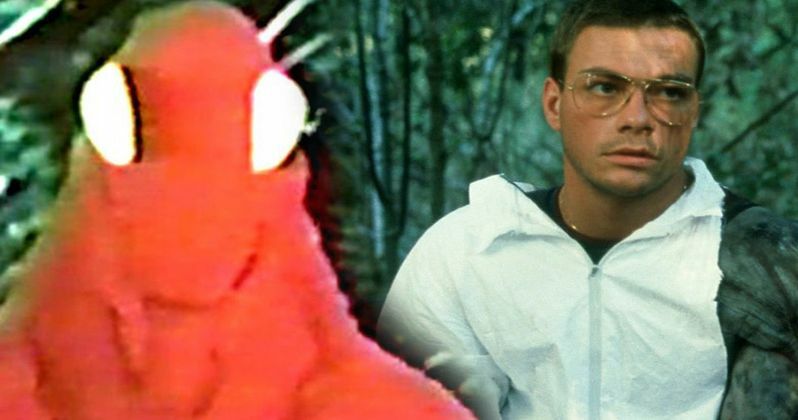 Van Damme says, "I've got my friend next to me and I said, 'Man, I ain't going to make it,'" which was only during the part of the production when they were making a body cast for the infamous red alien suit. He hadn't even gotten a chance to run around the jungle yet. Since Jean-Claude Van Damme wasn't as tall as the producers wanted, they stuffed him an ill-fitting suit and then made him walk around on stilts, which made everything even more uncomfortable. When he was asked by producer Joel Silver to jump for a particular scene, the actor didn't believe that he could pull it off while wearing the stilts. So, he decided to speak up about it. Van Damme had this to say about the incident. "When Joel asked me to jump, I knew it was going to be a bad one. I said, 'This is impossible, Joel. I think we're going to have a problem.' Then he replaced me." Jean-Claude Van Damme's story about getting fired from Predator differs from the rest of the cast and crew who state that the actor wanted the Predator to be doing kick boxing moves and not wear a mask. Van Damme was reportedly told numerous times that he had to wear the whole suit and that an alien doesn't know kick boxing. However, Van Damme was relentless and reportedly would show anyone that would watch how good his moves were. There have even been reports that he was fired because he kept on passing out. When the test footage was sent to the studio, they apparently hated it and said that Jean-Claude Van Damme looked like a rat, which is one of the other reasons that he was fired, according to reports. Whatever the case may be, the Predator story has become mythical over the years. 2018's The Predator cinematographer Larry Fong recently admitted to putting an Easter Egg in the latest movie during the Halloween scene. If you look closely, you can see Jean-Claude Van Damme's infamous red original Predator suit going out for some candy. The Jean-Claude Van Damme interview was originally conducted by The Hollywood Reporter.